The Bumbo Multi seat was definitely a product I massively underestimated. I got the Bumbo seat when I was pregnant and when you are pregnant with your first baby you struggle to imagine having a baby in your arms, let alone having a 5-month old little monster sat in an actual seat. I decided to write up the Bumbo Multi-Seat review for other mums and dads looking for a reliable seat that can be used from an early age. OK OK – I hold my hands up now; I admit it – “I underestimated how much use I would get out of this fantastic seat” THERE I SAID IT!! The fact it was lightweight and small in size meant it was mega easy to transport and it ended up coming everywhere we went. 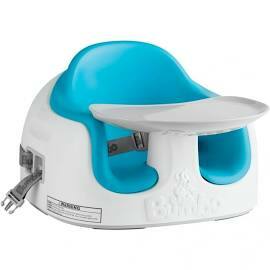 There is so many great features and benefits to the Bumbo Multi seat. The 3 in 1 seat means it can be used as a floor seat, a booster seat or a feeding chair. It has fully adjustable height & strap settings to ensure it is not only safe but has a longer lifeline than other baby products. The seat comes with a fully removable tray which is handy depending on what activity you are using it for. George had a toy that used to stick to the tray and he sat happily for ages playing with it. It was really handy when I was trying to cook dinner or trying to catch up on a few household chores. Don’t you just love secret compartments – I honestly am like a child myself. The Bumbo has a handy storage unit under the seat, this is where I often put wipes and a bib. The seat can be used from 5 months – 3 years (we did use it at around 4 months old as that is when George began weaning) George still uses the seat now and he has just turned 2, it is extremely easy to clean and we often transported the lightweight seat from place to place. We used this as George’s highchair for a long time as it doesn’t take up much space. The seat lasts a very long time and has a removable foam cushion for when your baby gets older which means you really do get your money’s worth. I loved how easy the seat was to clean and I always wiped it down with a baby wipe straight after use. There are two retractable straps built in to the side of the seat which means that when you’re ready to take it from floor seat to booster, all you need to do is just pull them out and clip them around the adult chair. If you’re using as a booster seat, safety fasten using the straps to ensure the seat is completely safe. Remember to check out our Baby Weaning Recipe section for some delicious recipes that will get your little ones taste buds going. Benefits of using the library to parents and carers This week I have mainly been….. worrying about eldest.